This entry was posted in News and tagged civil dialogue, First Five, religious freedom, Religious Freedom Center by Kristen Farrington. Bookmark the permalink. From daily experience I find no support for Ms. Farrington’s assertion that we have not learned to live with our religious differences. 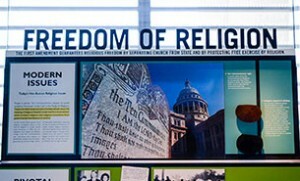 That we do not embrace the 1st Amendments freedom of religion. Yes, there are the militant atheists, the aggressive proselytizers (to the point of killing), the antis – Semite, Muslim, Baptist, evangelical, etc. exist, but day to day observation suggest they are less than 10% or our population, likely a much smaller percentage. Overwhelmingly U.S. citizens respect and honor freedom of conscience. What we lack is a unified, persistent and CONSISTENT expression of intolerance of the use of force in pursuit of religious hegemony. I agree that seeking the words to identify common aspects of different beliefs helps. A Muslim woman once reminded me that if we both believed God is one, then we were talking about the same one and that was a good place to begin. A college professor suggested we think of different faiths as different colored glasses looking at the same Sun. Our experience and culture color the glasses, not the Sun.